Love this place - super friendly service, good selection, and great execution on the donuts they choose to make. Favorite is the unassuming blueberry cake donut - give it a try! Stopped twice while visiting the area. Fresh and tasty pastries along with friendly service and reasonable prices. This place has been voted as having some of the best donuts in the Twin Cities. I have to stop for every business meeting we have that is near this place ( so about once a month) I get at least 12 each time and haven't found one that we didn't like yet! In this age of eating healthy and delivering "good" snacks to clients, I frequently turn to this place for the best in "naughty" foods that my clients and prospects LOVE! The staff is very friendly and I have always been treated well and had wonderful food. (Thou shalt not muzzle the ox while it is treading grain right?) This is a great place for wonderful doughnuts and more. 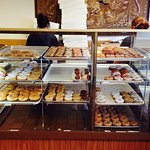 Been to Puffy Cream Donuts Plus? Share your experiences!